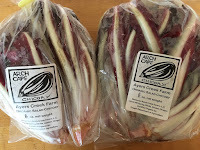 Having departed from the Hillsdale Farmers' Market after 14 years to refocus their energies on retail and restaurant accounts, as well as holding a monthly farm market, contributor Anthony Boutard and his wife Carol continue their work on the specialty crops that they've been breeding, including a red-ribbed Italian chicory. In the process of changing their business model, they've had to tackle issues of branding, packaging and distribution, skills outside of their usual fields that will no doubt evolve in the same deliberate manner as their breeding efforts. 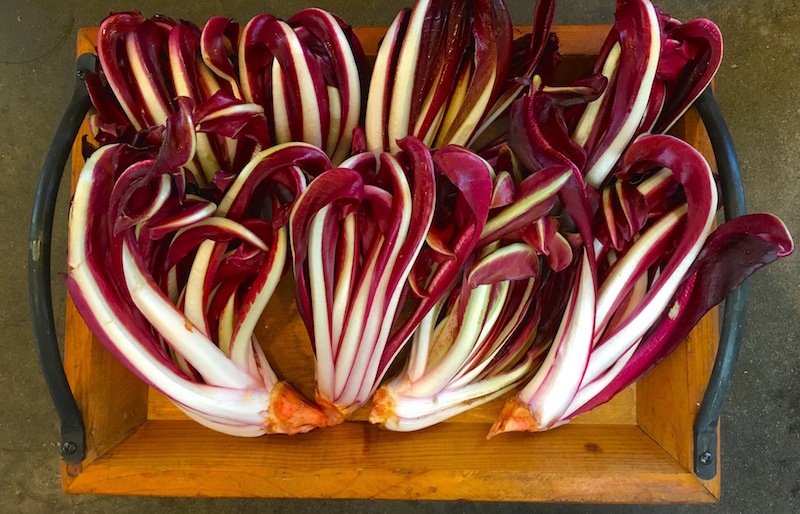 We started the "Arch Cape" project in 2012 with the goal of improving the quality and field characteristics of the late Treviso type chicory. Conceptually one of the finest chicories of all, but sloppy in its execution. We are happy with the early improvements, and will carry on our work. New Ayers Creek packaging with Anthony's linocut artwork. Yesterday we delivered Arch Cape chicories to a few stores and restaurants. Too good to be left being banged around in some cold and lonely produce bin, the chicories delivered to the stores are in half-pound bags with our label. Food Front: the northwest store on Thurman only. New Seasons Market: Grant Park, Concordia, Seven Corners and Hawthorne stores only. We expect to deliver to these same stores next Thursday as well. The supply is limited. 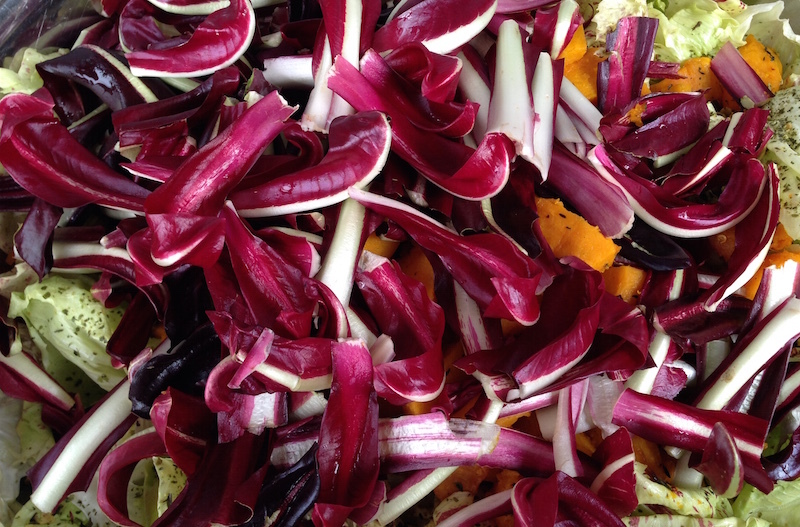 Chicory salad with squash and herbs. Lovely's 50/50: in a salad and on pizza. Nonna: in a salad with Asian pear and blue cheese. Nostrana: with grilled beef tongue. Woodsman Tavern: in a salad with blood orange. Maybe its time for a nice dinner out with a familiar ingredient list. Although we are assiduously and blessedly clueless when it comes to socialized media, and apparently far too prolix as well, there are some good Instagram photos of food prepared with our farm produce at #ayerscreekfarm. Good to see the care and fun had with these crops. Linda Colwell, the youngster among us, has helped us find that fast world, as well as making some delicious blue corn pita breads to accompany a Sibley squash soup. That gourd was so fine, the seeds will be in next year's planting grex.